The center stone in this 18Kt white gold Art Deco style engagement ring is a 0.67Ct brilliant cut diamond that has J color and VVS2 clarity. The setting is further enhanced by 44 small diamonds spread out throughout the entire openwork setting. The total weight of all diamonds is 0.95Ct. The ring is a size 6 ¾ and can easily be sized. 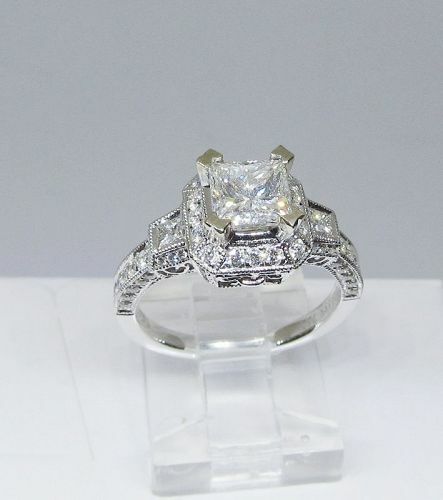 A fashionable halo style18Kt white gold diamond engagement ring centered by a 0.70Ct brilliant cut diamond. The setting is further decorated by 32 smaller brilliant cut diamonds. The center diamond is not certified but our in house gemologist graded it I color and VS2 clarity. The total weight of all diamonds is 0.96Ct. The ring is a size 6 ½ and it can easily be sized. For the princess in your life! 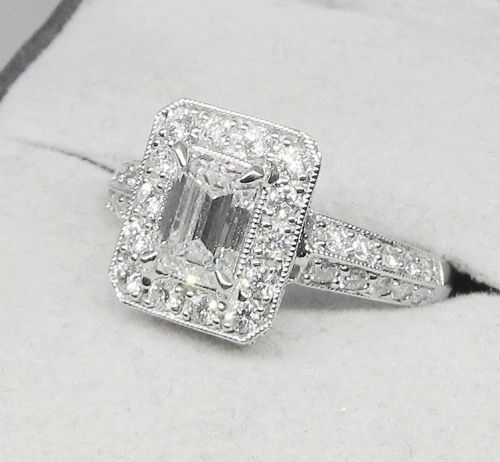 A very stylish 14 karat white gold and diamond engagement ring that is centered by a 0.56Ct princess cut diamond. 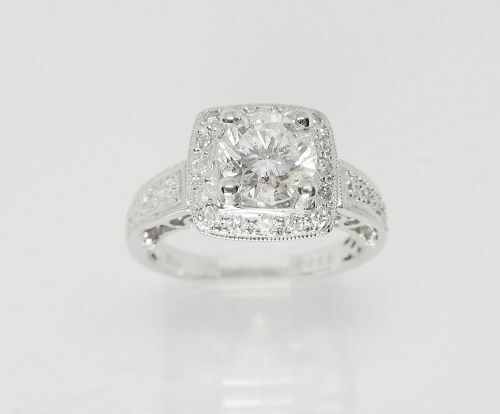 The center stone is flanked by a princess cut diamond on either side. The three center stones are further flanked by five straight diamond baguettes on either side of the shank. The approximate total weight of all 13 diamonds is 1.65 Carats. The diamonds have G to I color and VVS1 to VS1 clarify. The ring is a size 6 ¼ and it can easily be sized. Inspired by Princes Diana’s engagement ring is this 9 X 7 millimeter oval blue natural sapphire and diamond cluster ring. 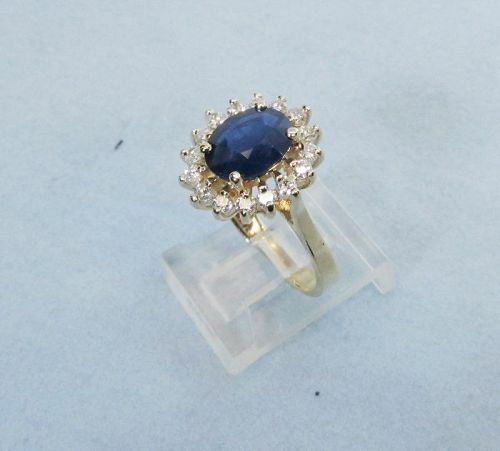 The 1.96 Ct sapphire is surrounded by 16 brilliant cut diamonds set in a 14Kt yellow gold. The approximate total weight of all diamonds is 0.40Ct. 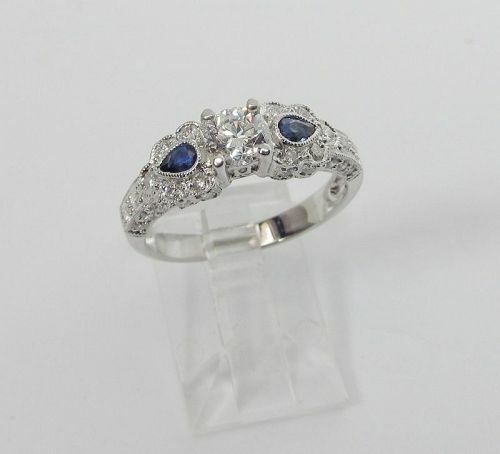 The ring is a size 7 ½ and it can easily be sized if needed. 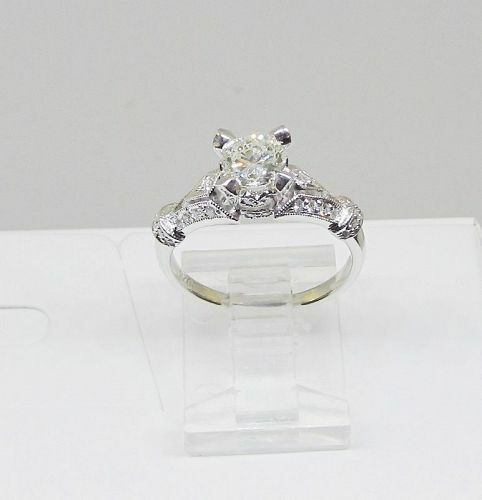 A stylish 18Kt white gold and diamond engagement ring centered by a 1.08Ct Old-mine diamond. The center diamond is not certified, but was graded by our in-house gemologist to be K color and VS1 clarity. 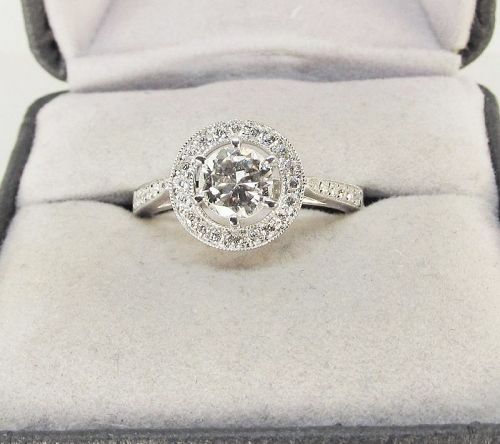 The 18Kt white gold “halo” design setting is decorated by 38 brilliant cut diamonds with the weight of 0.42Ct. The total weight of all diamonds in the ring is 1.50Ct. The size of the ring is 6 ½ but can easily be sized. 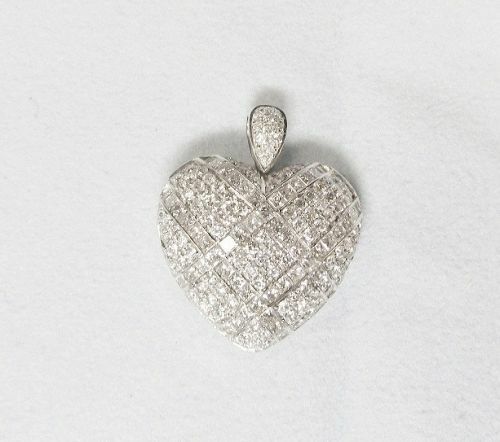 A very romantic piece of jewelry is this great diamond heart pendant. 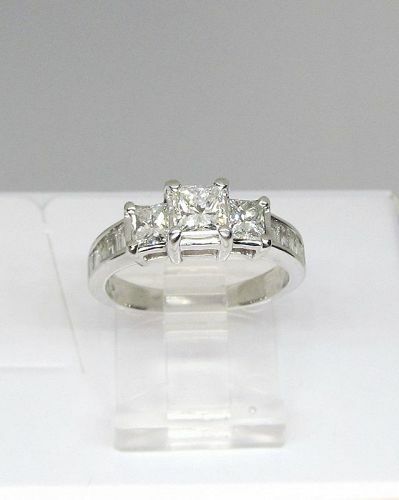 Set in 14Kt white gold and set with 165 high quality diamonds. The crossing lines are channel set with 53 square cut diamonds, while the remaining areas are pave set with 112 various size brilliant cut diamonds. The approximate total weight of all diamonds is 2.75Ct. The back of the pendant has a great openwork design. The width of the heart is ¾” and the height including the diamond pave bail is 1”. TR659 14Kw cuff-links MOP. 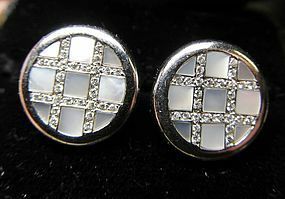 Diamonds $1250 A truly elegant pair of 14Kt white gold and mother of pearl cuff-links are decorated by 56 brilliant cut diamonds in a TIC-TAC-TOE design. The fields between the lines of diamonds are made of mother of pearl. The approximate total weight of all diamonds is 0.85Ct. 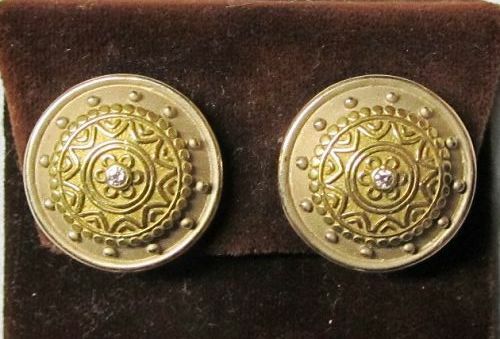 Elegant very well made Etruscan style 18Kt yellow and white gold earrings. Each earring is centered by a small brilliant cut diamond. The total weight of the two diamonds is approximately 0.10 Ct. The back gallery has an intricate pierced design with a double omega back and posts. The makers mark is SVG. 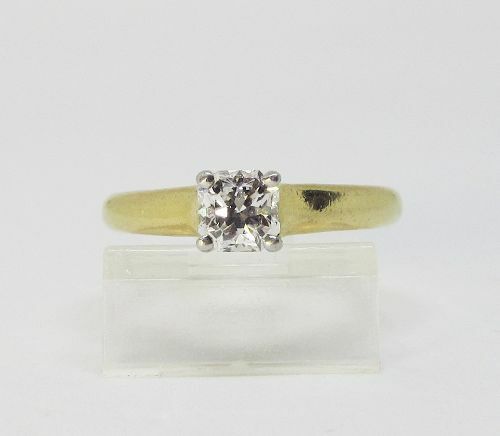 Take her breath away with the simple elegance of this fully hallmarked 1999 Tiffany & Co. 18 karat yellow gold and platinum diamond ring. The classic Lucida setting is engraved in the shank with its certificate number and diamond weight. The stone is a cut-cornered square cut 0.51 carat diamond of E color and VS1 clarity. 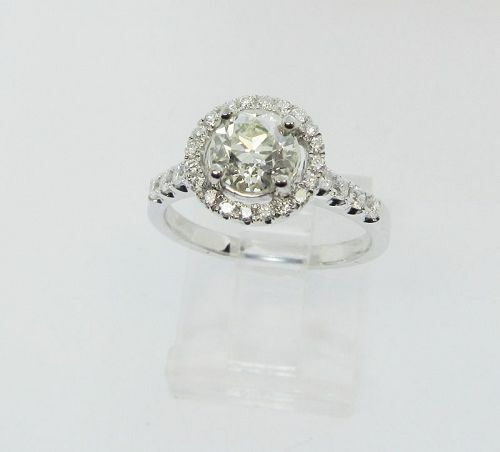 The ring is a size 5 3/4 and it can easily be sized if needed. The official Tiffany certificate accompanies your purchase. Priced well below the original retail price. Command attention in these dramatic onyx and mother of pearl earrings. 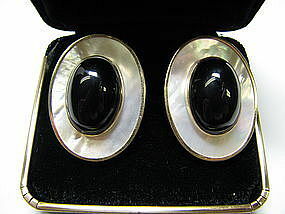 They measure 23 x 30 millimeters overall with an impressive 13 x 18 cabochon onyx in the center of each mother of pearl oval, all set in 14 kt gold. The posts on the reverse are made extra secure with omega backs to keep them fitting snugly. 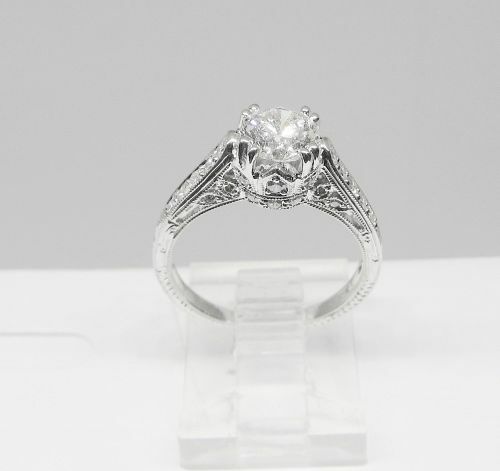 Declare your love in style with this contemporary engagement ring modeled after the elegance of the 1920’s. Set in 18 Kt white gold, the sparkling .99 carat emerald cut center stone is EGL certified as G color and VS1 clarity. 34 brilliant cut diamonds parade around the stone and down the band, bringing the total carat weight to 1.51.